In this week's update, we’ve included some key Battle Royale changes to aim assist, consumable drop rates along with a whole lot of bug fixes and performance improvements. That’s not all! We’ve introduced our second iteration of the inventory screen. Take a look below. Save the World stormchasers get access to 4 all-new heroes available to anyone who plays on Xbox One. Are you as excited as we are for The Game Awards? You should be, because Fortnite is nominated for Best Multiplayer title of 2017! Tune into The Game Awards Dec. 7 at 7:00pm PST. Details on a fun, new, limited-time mode will be revealed live! You’ve asked, we delivered. Peep the V2 inventory UI in this update. We wanted to ease a lot of the pain points for controller players and mouse players alike. Let us know what you think on the Official Forums, Reddit, Discord. Reminder: PlayStation 4 players have access to their own set of exclusive heroes. Added "terminal velocity" wind sound when falling from large heights, and impact/pain sounds for when taking damage from falling. Removed low-frequency content in the "ticking clock" sound that plays prior to the storm eye shrinking. If you haven't received a packet from the server in more than 1 second, the UI will also display a “Connection Lost” warning. Replaced the 60-second warm up timer with "Waiting for Players"
Sensitivity sliders for the mouse and gamepad will now stop at 0.01 instead of 0.0. 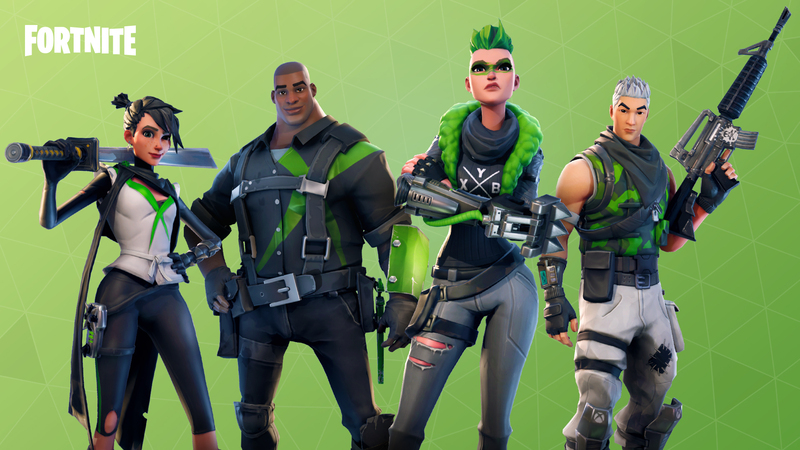 Xbox Exclusive heros are granted to all players who have purchased a Founders Pack on Xbox. Players will receive all 4 exclusive heroes after completing the quest "Loot Llamas". This is the same point most other Founders items are granted. Players who have already completed the quest will receive each heroes as they login. Increased effective range of the Vindertech Scoped Handcannon from 7.5 to 8 tiles, decreased damage from 62 to 56 and impact from 100 to 90 to rebalance accordingly. The “Head Explosion” alteration now scales up with the player's Tech attribute and Hero Level, rather than dealing a flat percentage of the player’s weapon damage. Using the incorrect resource type when trying to build a blueprint (such as “Build the Radar Towers”) will now properly show as red instead of blue. Vindertech weapons will use Crystal Energy and Ore Energy recipes as intended in the Crafting Recipes sheet. All recycled world items will now be removed from your inventory before the resulting items are added, reducing the chance of overflow dropping items on the ground. Tracks in “Deliver the Bomb” can now be placed where quest props or Outlander Fragments are. The cart will now pass through quest props and Outlander fragments so they won’t block players from using more direct routes. Added the missing quest update from a Durrrburger restaurant in the city. Picking up multiple items at once will no longer cause items to stretch into the player’s backpack and hang around for long periods. Vindertech weapons no longer give Blast Powder when disassembled. Legendary Hydraulic Hammers and Spears now correctly use Legendary level crafting requirements instead of Epic level crafting requirements. Fixed an issue which caused items that are picked up to fall off the map and be destroyed. Instead of being destroyed, they will be transported to their owner (if there is one) or to the closest player. Fixed an issue which caused Floor Healing Traps to not take up inventory space. Fixed an issue which resulted in transformation keys turning into a different item than intended. Fixed an issue which caused some containers to become permanently highlighted. Fixed an issue which caused the Head Clipper Spear to have an incorrect tier 1 power rating. Added 5 new daily discovery quests. Explore the zones to find specific locations. Drone Salvage activity now auto starts after 20 seconds if nobody starts it earlier. Players can now build around the crash site before it lands. The structures will take damage, so plan wisely. New map icons have been added for all secondary activities to make it easier to locate the activities you want to play. You now only need to find missing modules during “Repair the Shelter” missions. Mutant Storm Mission Alerts no longer spread. Instead, the number of Mission Alerts available at a time are set to a fixed target number. Mutant Storm Mission Alert quota remains unchanged at 10 per day. The Epic Troll Stash quest now completes upon opening the chest. Fixed a rare crash on shutdown related to online cleanup. Fixed Xbox One Rich-Presence text not updating in the Party Finder window. Fixed an issue which caused an error to appear when accepting invites from a suspended state on Xbox One. Added an option to logout from the Main Menu on PC and Mac. When comparing items, stat rows are now colored green or red based on which item's stats are better. When upgrading items, the stat change arrows are oriented based on whether the stats are higher, but the arrow colors are still based on whether stats are better. Clarified the pickup interact failure reason for M80s and bottle rockets, which are limited to a single stack in the backpack. Improved friend invite menu flow when in game. Larger stacks of items that are otherwise identical will now consistently sort before smaller stacks. Rescued survivors will no longer appear as items in the backpack during play. Fixed the bug where the item pickup notification might show the incorrect count. Schematic craftability is now properly refreshed after any change to backpack space. The Skills page alert will no longer appear for skill nodes that cannot be purchased. 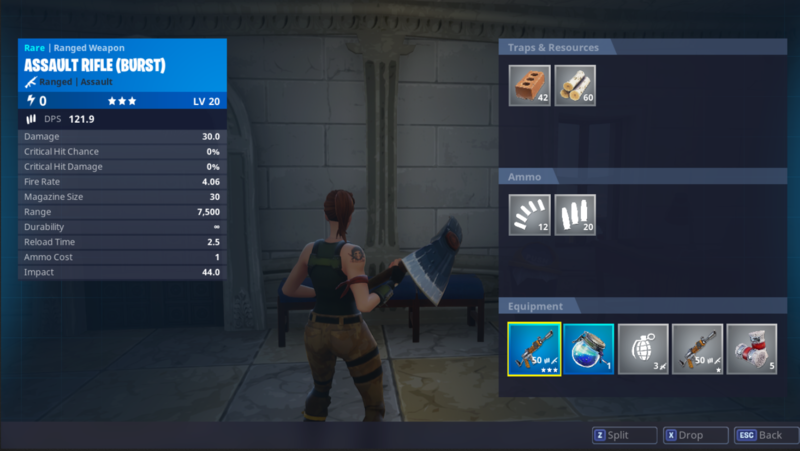 The Pickaxe Damage stat now correctly displays the effects of the "Work, Work" support perk. Corrected the interaction indicator HUD visibility toggle to control the proper HUD element. Fixed a few graphical issues that occurred when selecting a mission region. Fixed an issue which caused user options would not be saved. Fixed some text that was cut off in the menus. Fixed headshot damage display in the detailed stats menu. Updated art for the SEE-Bot and Hidden module found in Repair the Shelter missions to match the new models and animation. Updated art for the Med-Bot module found in Wounded Survivor missions to match the new models and animation. Multiple-in-one Upgrade Llamas now sell 25% off! Updated quest titles for the Stonewood Storm Shield Defenses 1 through 10. The notes below are already live, and should have been included in previous notes. They are listed below to confirm any undocumented changes. Shoutout to the r/FORTnITE for catching these! Epic Halloween heroes now have epic stats instead of legendary stats. Traps no longer set off propane tanks. This allows players more control over when the propane tank explodes and will prevent the explosion from damaging the players own traps. Fixed an issue that caused Element+Affliction weapon perks to display as a common “gray” rarity perk. The color now reflects the correct rarity of the perk. This was purely a visual change and had no effect on the chance of the bonus being rolled. We are aware of an issue that occurs to some players where downloads are extended in duration and users may believe that a "hang" has occurred. Our investigation tells us that the download is NOT hanging, but the process is taking longer than it should to complete. In the meantime, please continue to let the download and install process complete naturally. We are partnering with SIE to address this issue as quickly as possible.